The only shop in Llangennith is PJ’s surf shop – great for purchase and hire of all surfing equipment, but there are no food shops in Llangennith! The easy option is to get an online delivery. Tesco and Asda both deliver to Llangennith. Hillend Caravan Park (5 mins away by car) has a small shop, stocking basics and newspapers. There is also a shop at Broughton Caravan Park. These shops are open from Easter to the October half term, but opening times vary according to the season. Heronsway Services at Llanrhidian (10 mins by car), stocks basics, some local produce and newspapers. There is also a Post Office. Siop y Bobl at Llanmadoc (10 mins away by car). 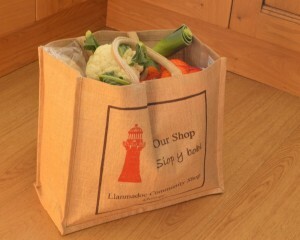 This is a community shop, run by local volunteers, which stocks basics and a good range of local produce. The shop is home to the Lighthouse Café (highly recommended) which serves tea, freshly brewed coffee, home made cakes and savouries. There is also a Post Office and cashpoint in the shop. Open Mon – Fri 10am to 4.30pm, Saturday 10am to 1pm. Post Office and cashpoint open Mon to Friday from 10am to 12 noon. NB No newspapers. Butchers ~ Tucker’s (opposite CK supermarket) sells locally produced meat and also laverbread, the local delicacy made from seaweed. Tesco Express in Gowerton 25 mins away by car. Tesco Extra at the Fforestfach Retail Park just before M4 J47 (30 mins by car). For more serious retail therapy, there are the out of town retail parks at Fforestfach or Trostre (on the A484 on the way in to Llanelli). The covered market in Swansea City Centre is also worth a visit for its fresh fish, and local specialities such as laverbread and Penclawdd cockles.